The MHC is pleased to be involved in The 40th Concours d’Elegance of America (http://www.ConcoursUSA.org). Concours Visitors on Sunday, July 29, cannot miss MHC’s Booth, as they pass through "Vendor Valley" before entering the main Concours Vehicle-display grounds. At the Booth will be the world’s first semi-trailer, built by Detroit blacksmith, August Fruehauf in 1914. August coined the phrase "semi-trailer”, when he converted a wagon into a trailer to haul a boat using a Model-T Ford. 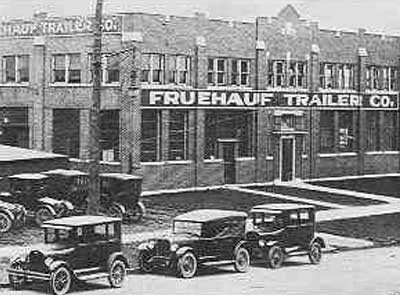 The Fruehauf Trailer company was founded four years later in 1918 and became the world's largest and most dominant manufacturer of semi-trailers for nearly a century. The trailer on show is paired with a rare 1913 Smith Form-A semi-truck adapted from a Model-T Ford. Model-T's were used for many commercial applications, including postal delivery, hearses, snowmobiles and many other uses. This unique truck and semi-trailer can also be admired at the Concours Truck Night on Saturday, July 28, from 6-9 p.m. The MHC’s main annual event is SAE International WCX World Congress Experience in Detroit. At the April 2018 SAE WCX, the MHC display focused on the "History of the Future”, featuring nine historic vehicles, whose innovations paved the journey towards today’s Autonomous Vehicles. The SAE WCX 2019 "History of the Future” exhibit will be built around the theme of “Propulsion”. MHC also has participated at the Chrysler Employees Motorsport Assn. festival in Auburn Hills on June 9 and at the Eyes on Design car show at the Grosse Pointe Ford Estate on June 17. The MHC collaboration with the Historic Vehicle Association continues, with HVA members' cars prominent at The Concours. Valued MHC supporters are SAE’s Detroit Section, with nearly 9,000 members (the largest SAE Section) and the very active Mid-Michigan Section whose programs include vehicle events, technical meetings, factory and museum tours and networking gatherings. All SAE Sections support SAE Student Chapters at local Universities, whilst individual members volunteer at schools, helping teachers apply SAE’s award-winning "A World in Motion” educational programs for K-12 students. At all these events, MHC’s activities promote SAE Membership, SAE’s Education Programs and the work of the SAE Foundation. For information on joining SAE International and MHC, please inquire at the Booth or visit http://www.sae.org.